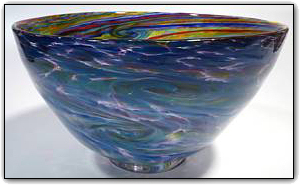 This bright & colorful bowl features shades of blue, purple, red, green, yellow, gold and more, all sitting atop an elegant pedestal. The interior features many colors of the rainbow, and the exterior leans towards the blues and purples as the inner rainbow shines through. The pattern was created with a complex process using canes of colored glass. Working with cane is a time consuming two-stage process, first Dirwood hand pulled the canes used to make this bowl and then he made this bowl using those canes. Make sure to zoom in to see how the colors interact with each other to form such intricate and complex pattens. Both the interior and exterior are windows into their own unique worlds to get lost in. Such an amazing and inspiring bowl!